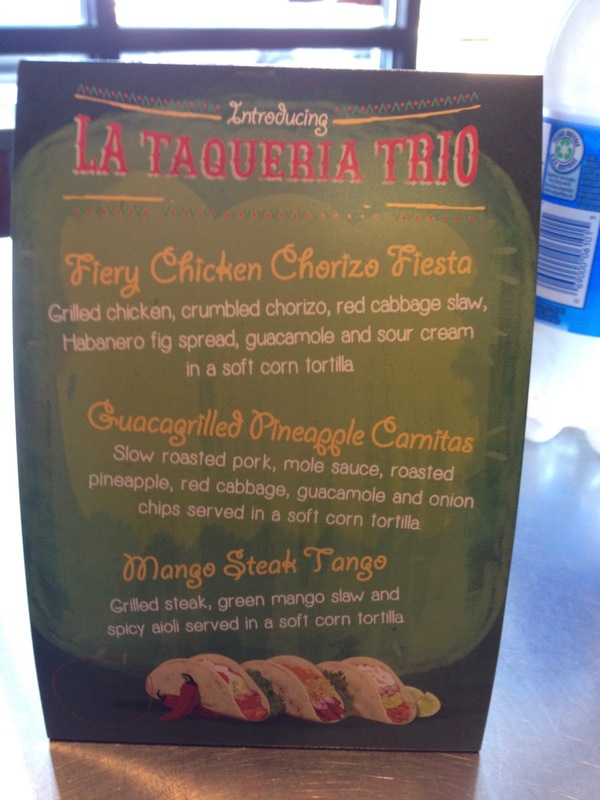 Mucho Burrito’s La Taqueria Trio cosists of three different flavored tacos. First the Fiery Chicken Chorizo Fiesta, which consisted of grilled chicken, crumbled chorizo, red cabbage slaw, Habanero fig spread, guacamole and sour cream in a soft corn tortilla. I found that the chicken within was dry, and drenched with overly sweet fig sauce. 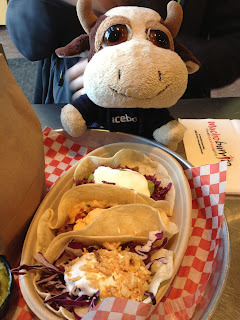 The amount of guacamole and sour cream was overwhelming, and texturally all I felt was this smooth creamy mix of sauce and had to search hard for the chorizo and red cabbage slaw. As well, the sweet fig spread didn’t really seem to go well with their guacamole, which I found lacked acidity. Next I tried the Guacagrilled Pinapple Carnitas, which consisted of slow roasted pork, mole sauce, roasted pineapple, red cabbage, guacamole and onion chips served in a soft corn tortilla. Once again the amount of guacamole was overwhelming and I could barely taste anything underneath it. I did manage to taste the pineapple sauce, but I wouldn’t be able to tell you what the mole sauce actually tasted like. 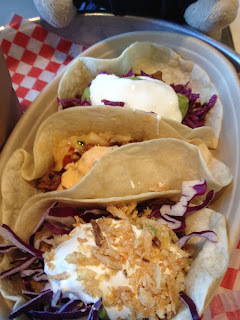 Lastly the Mango Steak Tango consisted of grilled steak, green mango slaw and spicy aioli served in a soft corn tortilla. The humans found that there was a mild heat from the spicy aioli, but found that the taste of the green mango slaw clashed with the aioli sauce and the steak dry and tough to chew. Although I wasn’t thrilled with any of the tacos individually, they did not work together as an offering on a single plate. The humans in particular found that if they tasted one, then the next one, then moved onto the last one, the flavors clashed horribly together. To the point that by the time they were done tasting all three tacos on the dish, they had a disgusting aftertaste in their mouths. Similar to a meal at a restaurant, things served on a single plate together should work together in flavor and in concept so that they compliment one another, which these three flavors did not. Unfortunately I would not recommend La Taqueria Trio at Mucho Burrito to anyone, as it took the humans and I a lot of water and a giant hot fudge sundae at Marble Slab Creamery to get that disgusting aftertaste out of our mouths. Although I didn’t get to try any of their other offerings other than guacamole and chips, after this experience, I’m in no rush to return to try what else they have just based on their La Taqueria Trio being over sauced and the majority of the meat to be dry, a moocho disappointment. Skip this limited time offering at Mucho Burrito and save yourself from a similar experience, perhaps just stick to their regular offerrings instead.